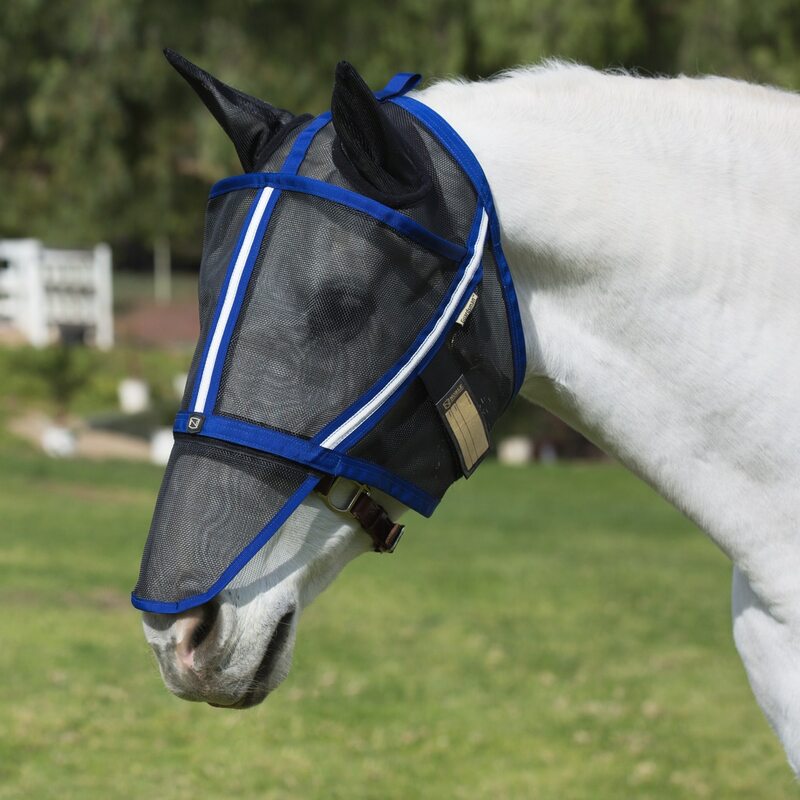 Let your horse stand out from the crowd in our exclusive Noble Outfitters™ Guardsman™ Fly Mask with Ears! The Noble Outfitters™ Guardsman™ Fly Mask with Ears is engineered for durability and comfort, unlike no other! 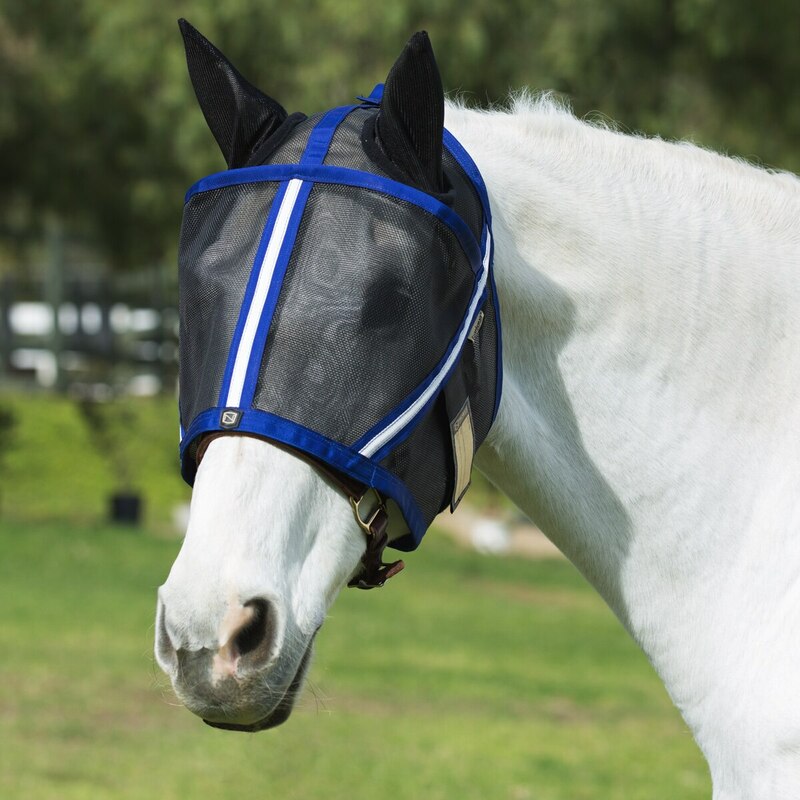 Unique patent pending Flex Spline Technology creates a canopy away from the horse's eyes, while unique contoured fit prevents insects from penetrating the mask. 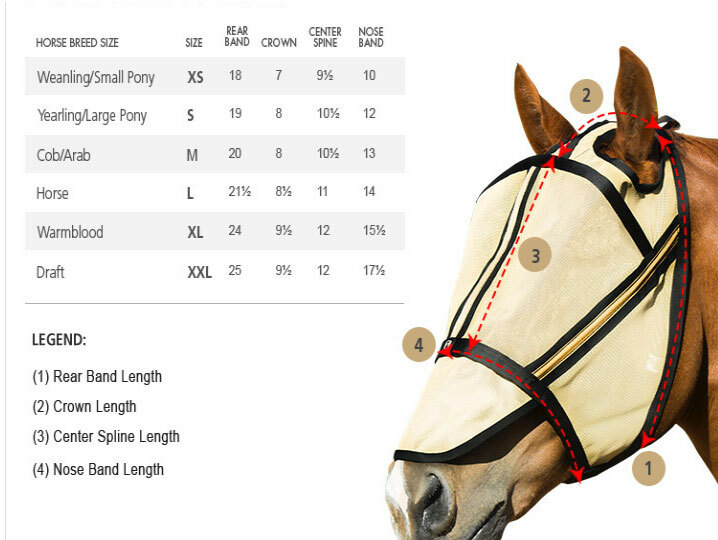 Noble Outfitters™ Guardsman™ Fly Mask with Ears - Made Exclusively for SmartPak is rated 3.4 out of 5 by 10. Rated 2 out of 5 by Jenna from Doesn't Fit Bought this for my gelding that has had issues with things flying in his eyes when its windy. The mask is great material but it is not shaped right to keep it off his eyes. He is usually great about accepting a fly mask, he would turn around or walk away as soon as he saw this one. I checked what was wrong with it and when he was standing still I noticed his eye lashes were poking through the mask and it would irritate his eyes. I returned this item. Rated 5 out of 5 by Kkell from Amazing product!!! I bought 4 fly masks about a month ago. They came fast and the quality is amazing! Noble outfitters has done it again with their fly masks! They are extremely durable and are just made right. I would totally recommend them to any equestrian looking for a new fly mask! Rated 5 out of 5 by Mack from Great features! Strong, fits well, stays off horse's eyes ! He doesn't RIP it off! Rated 4 out of 5 by Calvin48 from A really pretty color I haven’t used this yet, but I bought a Guardsman mask a couple of years ago and found it to be tough. My horse removes masks that he doesn’t like and he’s only had this one off a couple of times. It did rub his head in a few spots, so I had to sew fleece on those areas to protect his skin. He has a blaze with a pink nose and needs to wear a nose cover to keep the sun off his nose. I got this mask embroidered in light blue thread, which looks very nice. Rated 3 out of 5 by Tyty from Weird fit Decent fit but expected more eye room and thought it would be a more translucent mesh. Plus the pleats for the eyes are a little out of place. Rated 1 out of 5 by DKAD from poor fit Although the fly mask was well made and looked very nice it did not fit at all and my horse is a pretty easy fit for most things, other fly mask's fit well in a regular horse size. Too big on the bottom, no way to fix that. I think the pattern they use needs some work. Save your money. Rated 5 out of 5 by TrulyMacho101 from Perfect for my picky TB Ive had this flymask for a month now. Honestly when i opened the package it looked like it would fit a Clydesdale and not my fine headed thoroughbred. BUT, it fit him wonderfully and it doesnt rub him at all. Very happy with this purchase. Rated 1 out of 5 by Barbara from Poor fit - doesn't stay up off eyes This looked like a well-made fly mask, and I loved the idea that the fly mask would stay up off the eye. Unfortunately it just did not fit my 16 hand thoroughbred well at all. I tried both the large/horse and medium/cob sizes. On both, the fly mask touched the eye, but had a large gap at the muzzle. So unfortunately, I am returning these and trying another brand. I can't rate the durability or whether it runs large or small - it just plain didn't fit. Rated 5 out of 5 by Grace from Great and durable. I bought this a month ago. It is heavy duty I love it.